As a scholarly discipline, Black studies emerged out of protest. In 1968, responding to student activism rooted in the Civil Rights Movement, UC Santa Barbara was among the first universities in the nation to establish a Black studies department. Students and scholars advocated for African Americans to be included in the academic record. A half-century later, social justice, resistance and inclusion are still hallmarks of Black studies, but the field’s depth and diversity has expanded considerably. 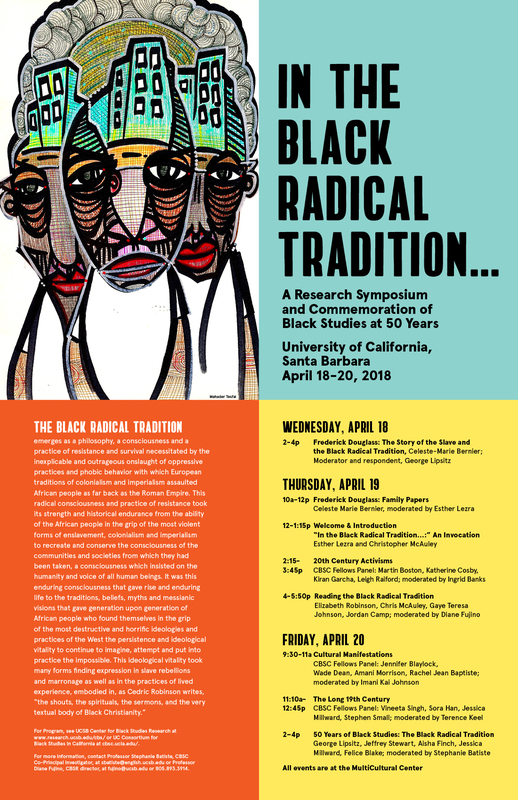 “In the Black Radical Tradition,” a research symposium slated for April 18-20 at UCSB’s MultiCultural Center, seeks to explore that complexity while also commemorating 50 years of Black studies on the campus. “The expansion of Black studies includes thinking about race as well as gender, sexuality, class, freedom and different cultural formations — like music, art and literature — as places where various kinds of ideas about knowledge, experience and being get worked out, and not just ideas of protest,” said Stephanie Batiste, UCSB associate professor of Black studies and of English, who is organizing the symposium. The term “Black Radical Tradition” was coined by Cedric Robinson in his 1983 book “Black Marxism: The Making of the Black Radical Tradition.” Robinson, who died in 2016, was a UCSB professor and director of the school’s Center for Black Studies Research (CBSR). “The Black radical tradition argues for a rethinking of U.S. and Western history — indeed world history,” said Diane Fujino, a UCSB professor of Asian American Studies and current CBSR director. “It critiques Western thought and philosophies for their inability to comprehend ‘racial capitalism’ in the study of political economy, social relations and philosophy. The collaborative symposium serves as the annual gathering of Consortium for Black Studies in California (CBSC) fellows, and is a high point in 2017-18 UCSB Consortium programming in arts, scholarship and activism that bears out the Black Radical Tradition, headed by Batiste. It also culminates a yearlong reading series in the Black Radical Tradition. Participants in the series read books by Robinson and the late Clyde Woods, also a former CBSR director, and “Futures of Black Radicalism,” edited by Gaye Johnson and Alex Lubin, which draws from Robinson’s book to reflect on current Black radical movements and thought. The three-day symposium will feature a panel focused solely on these books. Other highlights include two presentations by Professor Celeste-Marie Bernier, of the University of Edinburgh’s Centre of African Studies, on abolitionist Frederick Douglass’ inclusion in the Black radical tradition, and a new archive of his family papers. She added that the panel titled “The Long 19th Century” offers an opportunity to consider the very long history in the U.S. of African American activism, and links that to a more global experience in the 20th century. In addition, the symposium incorporates a Department of Film and Media Studies screening of the 2013 documentary “Whoopi Goldberg Presents Moms Mabley” at 7 p.m. Thursday, April 19, in the campus’s Pollock Theater.